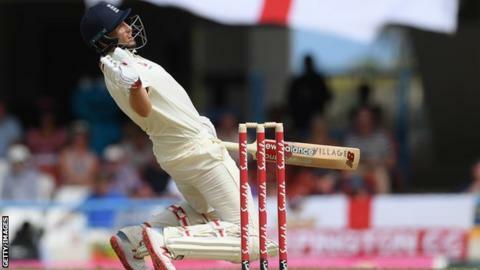 England collapsed once again as they were bowled out for 187 on day one of the second Test against West Indies. The tourists, who were dismissed for 77 in the first Test, fell to 93-6 despite Jonny Bairstow hitting 52. 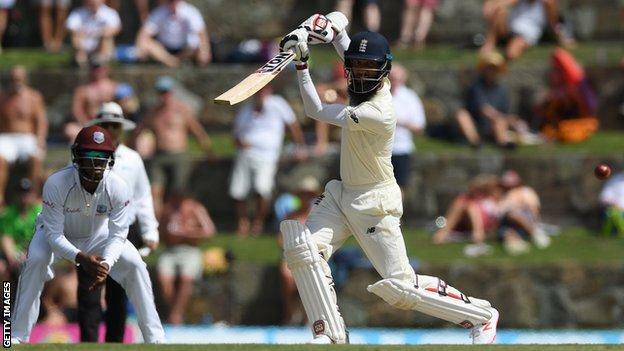 Moeen Ali struck an entertaining 60 and Ben Foakes made 35, but England lost their last four wickets for nine runs, with Kemar Roach claiming 4-30 on a pitch offering uneven bounce. The hosts reached 30-0 at the close in Antigua, trailing by 157. West Indies openers Kraigg Brathwaite and John Campbell showed superb discipline in batting out 21 overs and will resume on 11 and 16 respectively. England did not bowl badly, if slightly short, but will need early wickets on day two if they are to swing the match their way and avoid a series defeat with West Indies leading the three-Test series 1-0. Having also collapsed from 215-4 to 246 all out in the second innings of the first Test in Barbados, England were duly put in to bat by West Indies captain Jason Holder on a very green pitch. In difficult conditions for batting, new opening pair Rory Burns and debutant Joe Denly – replacing Keaton Jennings – both played and missed with expansive drives before falling early on. Burns edged a fine delivery from the impressive Roach that angled in and nipped away to be out for four and Denly, who narrowly survived an lbw shout on nought, was caught behind as he attempted to cut a short, wide ball from Alzarri Joseph. There was little captain Joe Root could do about his dismissal as Joseph got one to rear sharply off a length and loop off the glove, with Campbell parrying over his head at third slip and Shai Hope taking a diving catch running round from gully. Jos Buttler walked down the pitch trying to negate the uneven bounce but nicked a ball he could have left, and Ben Stokes was undone by Shannon Gabriel moving the ball away from around the wicket to edge behind, shortly after exchanging words with the fast bowler. Although Bairstow, Moeen and Foakes ensured England avoided a repeat of the humiliation in Barbados, this was another worrying batting performance, especially in contrast to the assuredness of Brathwaite and Campbell on the same surface. Moeen arrived at the crease with England 78-5 and made a frantic start to his innings, aiming wild hook shots at bouncers and missing the ball with flashy drives. But he hung in and found some fluency, connecting with those drives, not always trying to hit the short ball and attacking off-spinner Roston Chase to bring up an excellent fifty – his first in 10 Test innings. He shared a determined stand of 85 with Foakes, briefly putting the pressure back on the hosts, before he skied a ball from Roach that seemed to stick in the pitch. While it is untenable to be that frantic to start an innings, Moeen may have flayed his way into some welcome form after a torrid run that saw him average 9.75 in the first four Tests of the winter. Bairstow earlier counter-attacked superbly, capitalising on some wayward bowling to strike nine fours and one six before he fell lbw to the second ball after lunch as Roach angled it in to his pads. Foakes showed better defensive technique than his team-mates in support of Moeen until falling in unfortunate fashion as he gloved a loose short ball from Gabriel on to his hip and then the stumps. Bairstow took the wicketkeeping gloves as Foakes received treatment for a bruised right hand. 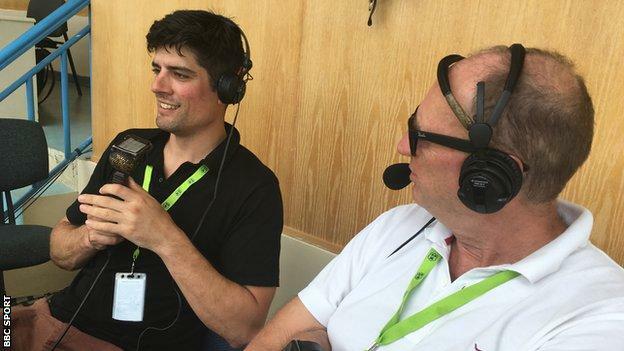 Former England captain Alastair Cook on The Cricket Social: “England will be feeling hard done by. Barbados was a horror show, but those were tough conditions. It was a good toss to win. “In the first two or three hours, the variable bounce was the most I have seen in my career. BBC cricket correspondent Jonathan Agnew: “It was a fascinating day’s cricket. There was lots of indifferent bounce and some hostility from the West Indies fast bowlers early on.